Last weekend I trekked down to the 3 Stars Brewery in D.C. to pick up the grain I purchased in the local DC Area Grain buy. The grain buy is hosted through the "Group Buy" section on the Homebrewtalk.com forums. 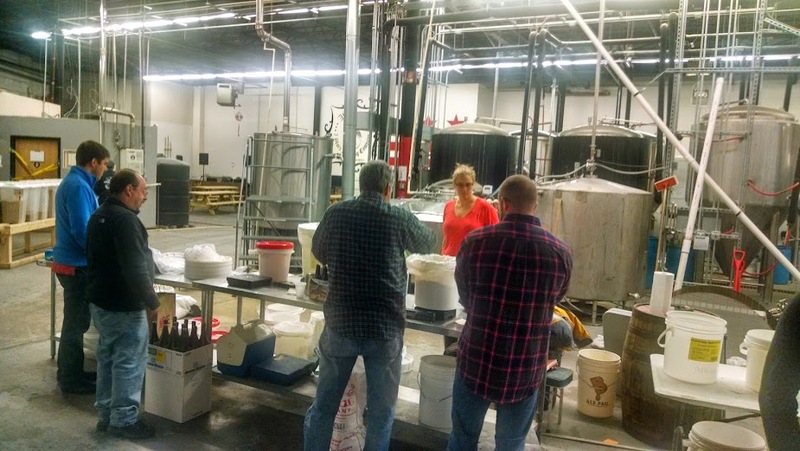 The group started almost two years ago and is only possible by the brewery/brew store's help. A little history: before this group grain buy, individuals could have accounts with the major malting suppliers and have pallets of grain delivered to their house. A lot of homebrew clubs would have an account with the malting company and purchase sacks of grain through these accounts. This changed a couple of years ago when the malting companies up the prices they were charging to homebrewers - any accounts which didn't have a tax ID (EIN) for brewing purposes. Then, they decided to stop selling to all those accounts not associated with a brewery or homebrews shop completely - we were immediately cut off! I don't know if anyone figured out what the impetus for this was, but there was much speculation that homebrew shops pushed back on the malting companies because they were losing out on business. So a big thanks 3 Stars for facilitating the purchase. The group buy takes a few members to organize and handle payments. The DC group buy utilizes a protected (must receive permission to view the sheet) google spreadsheet. 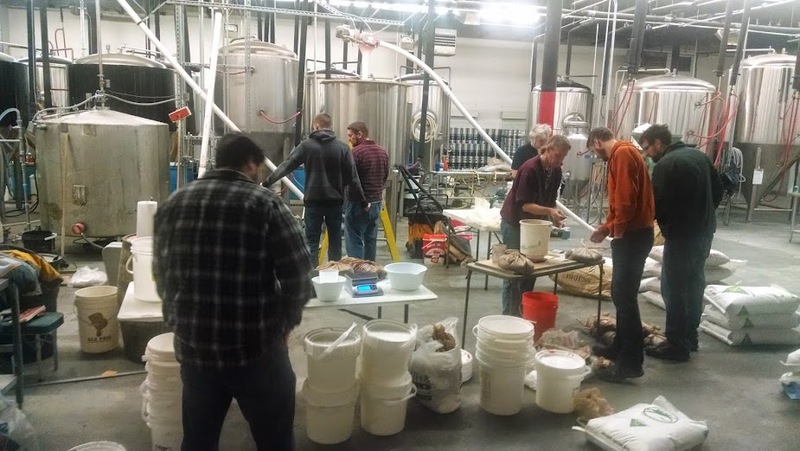 One person manages all the full sack purchases, and another handles splits - multiple people splitting a 50lb sack of grain which is generally a specialty malt. As the grain requests reach a pallet or more (~42 sacks), the group decides on a date convenient for the majority of the purchasers and all the buyers send paypal payments to the group organizer. The group organizer then submits the bulk purchase to 3 Stars and schedules the pickup date. When organized well, like this buy is, things go very smoothly! I arrived a little early on the pickup day with my 55lb scale to help with separating the splits. The split organizer had labels with everyone's HBT screen name, the type of grain, and the weight they purchased. These labels were organized for each bag of grain to be split. There were 4 other groups of people splitting and it all happened in less than 30 minutes. After I helped split sacks and loaded up my car, I wandered into the 3 Stars Homebrew shop to purchased some other ingredients for future brews - yeast and fermcaps this time. I was then back on the road and headed home. So how much $avings are we talking? Well first off, purchasing from the group buy gives you a much larger selection of bulk grain options. 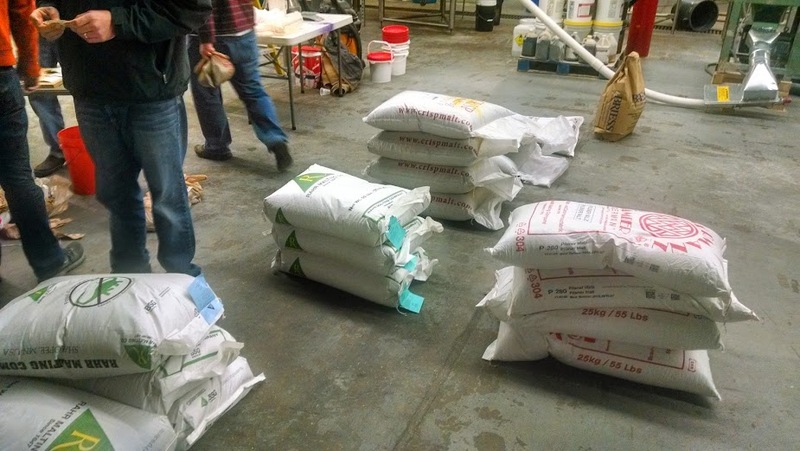 A lot of homebrew stores carry only a handful of base malts in full sack quantities. The group buy offers malt from Briess, Chateau, Crisp, Patagonia, Muntons, Rahr, Simpsons and Weyermann. So that is an intangible bonus to a group buy. The brew store I normally go to charges $52 for a sack of basic 2-row. The European pale ale and pilsner malts are in the $60s range. When you purchase by the pound, the rates go up even higher! Two of the grains I bought I can't even buy from my local store without special ordering, so I didn't even include the sack price there. Gas to get back and forth to both the bulk location and my local brew store is about $6, but since its about the same I wont include that here. After all is said and we are looking at a savings of $40.60, or about 26%, on 120lbs of grain. Pretty solid! Depending on recipes I should be able to get around 10 different five gallon batches of beer out of this purchase. I'm not sure what set everything into motion but there wasn't much benefit to the wholesalers to sell directly to homebrewers at a pallet at a time (little repeat business) and it seems as though many of the shops were strongly opposed to the group buys through the wholesalers so reason suggests they were the ones who convinced the wholesalers to cut us off. Unsurprisingly, as soon as the group buys were cut off it seemed like most homebrew shops promptly raised prices on grain. Adam, I agree there wasn't a real incentive for the wholesalers to sell to homebrewers. I don't think I have seen a whole lot of increase prices by the homebrew shops in my area other than margins passed on from the wholesalers. I do know there has been somewhat of a shortage in crop recently so I am sure prices will continue to increase.